« This is Your Life, 2017! This quote reminds me of one of my favorite authors – Stephen Covey. In his book, The 7 Habits of Highly Effective People, this is Habit 5: Seek first to understand, then to be understood. It also brings to mind a training class I took several years ago in which the visual was a stick-figure who was shouting through a megaphone. And the message was directed to another stick-figure who was listening through many filters. The third picture showed the two figures with their backs to one another and the emotions of confusion, frustration, discouragement and borderline anger. Have you ever seen two stick-figures angry with each other? Quite a sight, I’m telling you! What about two individuals in confusion, frustration, discouragement and near anger? I think we have all had that experience! Communication. Why is it that when we see or hear that word, we immediately go to the vocal area of communication? It only takes a few more seconds for communication to move into ‘evaluation and response’ mode. This, dear friends, is where the communication path becomes challenging. We are so quick to formulate a response; we have likely not even heard what is being said! What is getting in the way of the art of listening? For most of us, when we speak we want to be heard and we want our message understood. Right? And, when we are not speaking – we are expected to be listening. Seems simple enough; however, we are listening with our filters. We are listening from our own personal perspective. These are the experiences, what has influenced our lives and our understanding of how life operates. It is our frame of reference and it is what we ‘know’. And then, our minds (liking to be busy) begin to formulate a response based on our filters. The problem is: have you really heard the message? Did you hear the ‘underlying’ message, the meaning, the intention, the unsaid, and the conversation from the speaker’s point of view? IF you were formulating your response, you likely missed the message!! 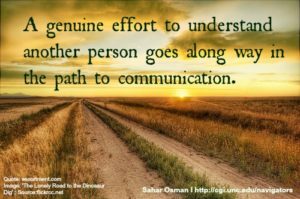 How does one intentionally communicate – for genuine understanding? What is really involved in: Seek first to understand? 5. Be Certain; restate your understanding and ask clarifying questions. It really is about how you are intending to BE as a communicator! Communicate in the capacity of understanding what another person is experiencing from within the other person’s frame of reference, with attention and the willingness to fully engage in the exchange, to listen actively, absorb the point(s) and to seek understanding.